Shimano Anatares and Metanium baitcasting reels available in the U.S.
Introduction: How many times have you looked across the pond and wondered why do the reel manufacturers keep the best stuff exclusively in Japan? The lines between JDM enthusiast imports and high end baitcasters has just been crossed as Shimano announced this morning that it is now making both the Antares and Metanium baitcasters available to the U.S. market. This announcement came as little surprise to some anglers that were wondering just when Shimano was going to revamp their flagship reels. Rather than create something specific for the U.S. market the company has finally done what many anglers have specifically asked for, they have made their arsenal available to anglers seeking the highest performance, and are willing to pay for it. Antares: For those that have not been following the JDM enthusiast market the Antares is designed as a flagship reel with all of the latest Shimano technologies. 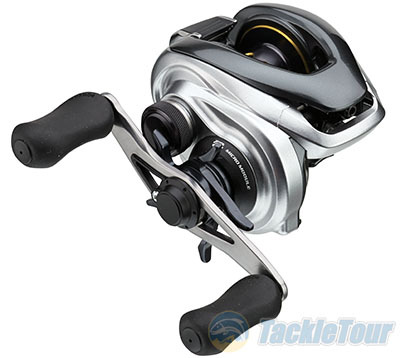 The reel is constructed out of magnesium and weighs in at 7.9oz. and is available in 5.6:1 and 7.4:1 gear ratios and right and left hand retrieve. Each reel comes loaded with 10+1 bearings and what Shimano calls �Micro Module� gearing which makes use of smaller teeth and more of them for more contact points between the drive gear and pinion gear. This design is intended to create a more efficient gear train, and one with less gear �feel.� The reel also benefits from X-Ship for improved gear durability and a reduction of friction between the spool shaft and gearing, which is designed to enhance casting performance, especially with lighter finesse lures. Shimano then combines this with their �G Free Spool II� which is a large diameter lightweight magnesium spool and a conically shaped levelwind to reduce friction. With a magnesium frame and spool combination you can imagine that this reel is not intended for use in saltwater. �Our new Antares reels are all about long-distance casting performance, and the latest in baitcasting reel technology,� Robby Gant, with Shimano�s product development team said. �We know there�s a avid group of bass anglers who want to fish with nothing but the best � and this is it from Shimano.� So how much will this flagship reel cost? Try $599.99 per copy, performance doesn�t come cheap but that probably won�t deter Shimano enthusiasts that are just happy the reel is finally available domestically, and backed with local warranty coverage and support. Metanium: Does the Metanium look familiar? This reel is basically the Japanese Chronarch CI4+ and is positioned above the domestic reel with use of a combination of magnesium and CI4+ material which gives the reel a more refined and entirely different feel, something we have experienced firsthand as we have been comparing the reels side by side on the water. The Metanium is available in 6.2:1, 7.4:1 and a blazing fast 8.5:1 retrieve in both right and left hand configurations, and all reels come loaded with 9+1 bearings and the same type of micro module gear system as the one found in the Antares. These reels are extremely lightweight at only 6.0-6.2oz. 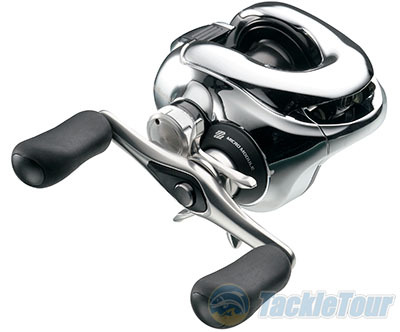 depending on gear ratio, and are designed to be an extremely versatile high performance reel series. With so many retrieve ratios to choose from there is a Metanium for everything from cranking to flipping applications. �It�s all about being versatile when it comes to the Metanium reels,� said Gant. �Not only do we offer anglers extremely light and exceptionally smooth reels, but you also have your choices in gear ratios so you have the optimum reel speed for the fishing techniques you use most.� Unlike the Antares because the reel doesn�t have as many exposed magnesium components this reel can be used in light saltwater applications as long as it is rinsed after each use. The Metanium reels will retail for $419.99 each. Over the course of the next week both the Antares and Metanium will start becoming available at e-tailers and retailers. These ultra-premium reels are certainly not for everyone, and at these price points they definitely cater to the enthusiast crowd. Shimano has been criticized by anglers over some of their mainstream baitcast moves, just think Chronarch E and Curado G, and over the last few seasons there is no doubt that competitors have gained ground in the high-end space, but the introduction of the Antares and Metanium are an opening salvo, proving that the company is taking the premium segment of the market very seriously. Today is an exciting day for Shimano fans, as well as fans of ultra-premium reels in general, and we look forward to the trend of a unified global product line continuing.